Open plan kitchen diner, log burner, new arch door, kitchen work tops and full lighting through out. “Excellent work – quicker than we thought, and all within budget. All the team are very knowledgeable about the job as a whole (not just their bit). Communication with the company was excellent and the standard of work was really high-end. Just as importantly, all the crew were friendly, helpful, polite and very tidy – makes a HUGE difference to the stress-levels of a project in a family home – this is probably one of the biggest recommendations from us! Over a number of years i have used many builders and with hand on heart i can truthfully say that jim and his team have been the best builders i have employed and i wish i had known a company as good as his and saved my self a lot of hassle over the years. When i decided to convert my garage the thought of finding a builder filled me with nothing but dread, so when i started searching i was pleasantly suprised when i came across jim’s company. The company wasn’t the dearest nor the cheapest but from his initial visit and receiving the quote and the outline of what was to be done i knew his was the company i would use. The garage needed to be converted for my mother in law who had a stroke and didn’t want to go into a home. She now has her own sitting room bedroom and wet room and she loves it. I would just like to say to jim, troy and the lads thankyou for a great job you were always clean tidy promptand never let me down. Veronica Melling , Annex, Soffits and fascias and front path block paved. What started out as a Garage Conversion turned into so much more! 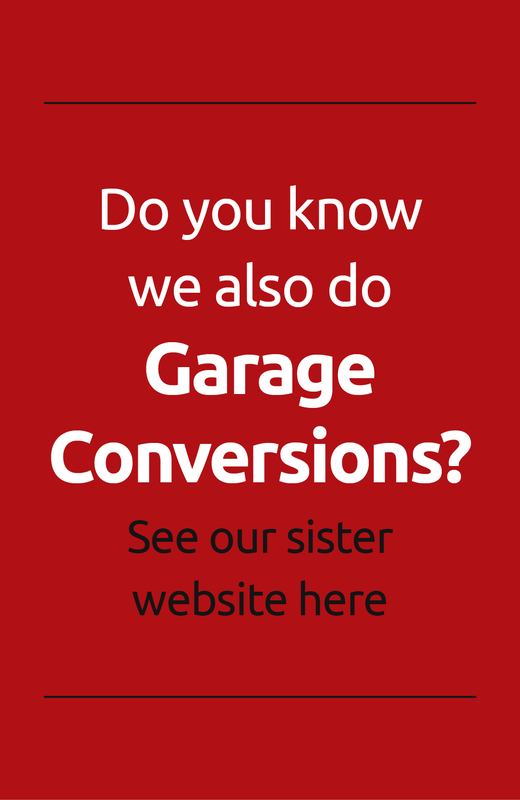 When Jim first visited to discuss converting our garage, it was clear that he is very enthusiastic about what he does and more importantly very knowledgeable about what we wanted to achieve with our garage. This was reflected in a competitive price, detailed quote and excellent lead time for completing the job. The work on the garage moved along quickly, efficiently and cleanly, which led to us asking for more quotes on other work we wanted doing – a conservatory, new windows, drive extension, relaying of the patio, sand-blasting of the house! Again, all of the quotes were competitive and completed quickly and efficiently, in fact all of the work was completed in 3 weeks – which included a long bank holiday and a few days of bad weather! Jim has been more than helpful in sorting out any small issues we’ve had since the work was completed. We’ll definitely make sure Jim’s first in line to quote when we add a second storey to our garage. Big thank you to Jim, Troy and team – we would recommend Convert Your Property wholeheartedly. We were recommended Convert Your Property by a friend and were initially impressed with the response to our enquiry and the quotation received.Once a price had been agreed, the work proceeded as scheduled and we were kept informed on a daily basis as to the progress and what materials/work would be undertaken the following day. There were a couple of problems along the way,however they were corrected swiftly and at no further expence to ourselves. The agreed work was completed on time and on budget [no nasty surprises!] and there was no problem getting they to return to sort out any snags. The quality of the workmanship is to a good standard and would recommend them to others and certainly we would use them again. Mr A Warburton. ORANGERIE TESTIMONIAL TOTTINGTON. Totally professional from start to finish. Jim gave us confidence with his straight and no messing approach, he certainly understood what we needed and offered a competitive price. The guys doing the work were simply brilliant. Turned up sharp and early working tirelessly to get the work done. Courteous and friendly, they took full pride in their work. Everything was covered exactly as we had asked and we could not believe the high standard of quality of work completed within the timescales it took to finish the job. Even the neighbours keep coming round to look! More than recommend the team if anyone is looking for them to do a job. Top work lads… Well done. I contacted Jimbo in in February to quote for a garage conversion, Jimbo attended and gave a thorough quote detailing all the works that were going to be done and at a price that was very reasonable, we did not get another quote, we didn’t need to you just know when everything will be done how you want it by the person you would want to do it!! I was really impressed with Jim’s service from the moment I met him. He offered a very competitive price with extras included. The work was completed within 4 days, he was incredibly organised as a project manager and any concerns I had were dealt with swiftly and in a professional manner. I would definitely recommend Jim and his team to anyone in future. First up, cheers for a job started and finished on time. That’s easy. what’s harder is saying how pleased we are without sounding like we’ve been bribed. we haven’t, but if you want to, then go ahead! From the first meeting, to the final ’ta-da!’, it’s been a pleasure to have you, Troy and the team work for us. Initial consultation and estimate service was easy and helpful and I liked that you discussed pros and cons of both the potential ideas we had and were honest about which was easier for you, before agreeing to do the other. We went with an extension to the front of the garage, freeing up space behind, which has now become a much needed study. The room is perfect and the velux roof provides so much light and airiness. We left the house open and accessible every day, with complete faith in all who worked. we weren’t disappointed. I took to popping home at lunchtimes, just so I could marvel at the speed, effort and professionalism with which the job was undertaken. Any minor problems were raised with us, very quickly and didn’t affect the agreed price, with the final building looking really good. I can’t wait to move my new furniture into it. We shall all really miss Troy, who turned up before first light on the nastiest and coldest of January mornings and got stuck in to his work with relish and professionalism. He was still there, well after 5 each evening, doing the same. A few years ago, we were badly stung by another builder. Jim understodd some of our reticence about the whole project and went out of his way to reassure and discuss prior to commencement. Once the work was underway, he didn’t really need to – we could see for ourselves. From talking to the lads, I know they place great value on their ’one job at a time’ mantra. This means for the week (or in the case of us, with building work too, fortnight) they are with you, they are with you. Working for you and with you to deliver the room you want. Would we recommend – Wholeheartedly. Will we use them again – oh yes! Saving up to get the kitchen flat roof converted to a pitched one already!! A building firm that actually do what it says on the tin, at the time they say they’ll do it and the price they say they’ll do it – Priceless! A big thank you to Jim, Troy & all the team. They were friendly, efficient and nothing was too much trouble. The work was carried out in record time to a very high standard, and we are so pleased with our garage conversion. We would definitely recommend Convert Your Property. Once again, a big thank you & we’ll see you tomorrow with the balance! Single Conversion with pitched roof. We were recommended Freeform Construction by a friend and were initially impressed with the response to our enquiry and the quotation received.Once a price had been agreed, the work proceeded as scheduled and we weere kept informed on a daily basis as to the progress and what materials/work would be undertaken the following day. There were a couple of problems along the way,however they were corrected swiftly and at no further expence to ourselves. The agreed work was completed on time and on budget [no nasty surprises!] and there was no problem getting they to return to sort out any snags. The quality of the workmanship is to a good standard and would recommend them to others and certainly we would use them again.